I know, I know, it’s only the 19th of November, but that means that it’s only 36 days until good ol’ Saint Nick pays those on the nice list a visit! Although I’ll be working all day on Christmas day, (If you feel bad for me a bit, don’t, they pay is great) I’m definitely in the mood for the festive season this year! I’ve already got loads of really great Christmas blog post ideas, so I guess this is the start of the festive blogging here on Love, Maisie! A polar bear.. wearing a headband with reindeer antlers on it.. wrapped up in fairy lights, erm, a little ridiculous really, so of course I want it! I can’t find a UK link for this jumper but you can find it on the US Amazon for just under £20! Really, you could wear this jumper all year round, couldn’t you? I don’t care what anyone says, if you say that you don’t wake up early on Christmas Day, you’re lying. This jumper is from New Look and will cost you £19.99. New Look have a fair few Christmas jumpers in this year and it’s not just this one that’s pretty epic! See here here and here! Of course I needed to include a pink jumper in this post and what’s better than a pink Christmas jumper with a sassy penguin on it? Not much, I know. Believe it or not, this one is actually from George at Asda! It’s currently out of stock on their website but I’m sure(#praying) it’ll be available again soon and you can probably snap it up in store too! £14 and it’s yours! A fairly subtle jumper now, but this Joules number is pretty sweet! Obviously, with such a brand comes a chunky price tag so this bad boy will set you back £50, but I personally think it’s totally worth it! If you’re not sure about how you feel towards Christmas jumpers, then perhaps something along these lines would be more suitable for you! Currently available to buy from John Lewis online, here. Last but not least is another adorable jumper from George at Asda! Now, not only is this cute, glittery printed jumper erm CUTE AS HECK, but it’s only £12 AND it lights up AND it’s musical! Oh my word, have I sold it to you yet? Maybe a little ott for some, but I’ll definitely be picking this one up next time I stop by Asda! 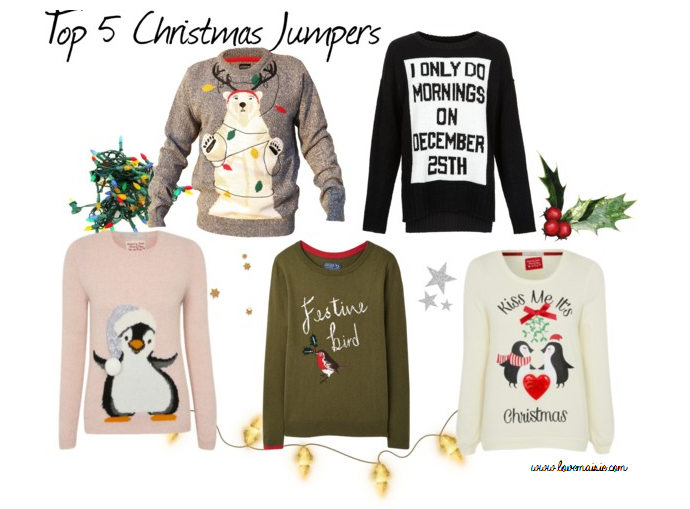 So there we have it, my top 5 picks for Christmas jumpers this year! Are you feeling in the festive spirit? What’s your favourite Christmas jumper? Let me know!